The Arcane Society was born in turmoil when the friendship of its two founders evolved into a fierce rivalry. Sylvester Jones and Nicholas Winters each sought to enhance their individual psychic talents. Winters' efforts led to the creation of a device of unknown powers called the Burning Lamp. Each generation the Winters man who inherits it is destined to develop multiple talents - and the curse of madness. A dreamlight reader, Adelaide should be able to manipulate the Lamp's light to save both Griffin's sanity and his life. But their dangerous psychical experiment makes them the target of forces both inside and outside of the Arcane Society. And though desire strengthens their power their different lives will keep them apart - if death doesn't take them together. 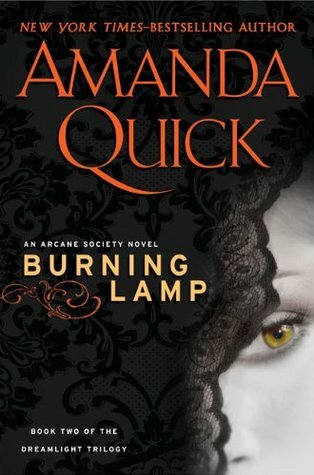 I hate to admit this, since I DID enjoy Burning Lamp and found it a nice, easy, breezy read, witticisms and interesting characters included, but it didn't escape my notice that Burning Lamp was just a pretty repetition of Fired Up, but in an historical setting. Dialogue and actions and some of the scenes were very similar, and while I applaud Amanda Quick's smooth connections between contemporary and historical (as well as all that foreshadowing that we already know occurs since the contemporary time line came first), it just wasn't as memorable an experience as I would have liked given that Fired Up came first. Not the entire book is the same, of course. I do love the interactions between all of our characters, Adelaide and Griffin, Mrs. Trevelyan and Delbert, and even with Jed and Leggert, and the inclusion of Caleb and Lucinda Jones. Burning Lamp is a nice bridging connection between the first book in the Dreamlight trilogy, and the last, but I can't help but realize that not much occurs in this book that we don't already know about. Very little forward progress is made, and it makes me feel that the next and last book in this sub-trilogy will really need to step it up in order to bring the story arc of the 'Winters Curse' and the 'Burning Lamp' to a close. Frankly, given my love for the Harmony series, obviously my hopes are pretty high; although even if things don't turn out the way I want, I'll still enjoy myself. Seeing as how Midnight Crystal will involve not only the cursed Winters man, but also a dreamlight reader who's last name is Jones, I'm feeling that a lot of things will come full circle into a nice wrap up. After all, the Winters and the Jones are supposed to be enemies, according to legend. All else fails, Harmony books always play up the dust bunnies to make everyone happy--I'm not above swooning over dust bunnies if the book itself doesn't entirely entice me. 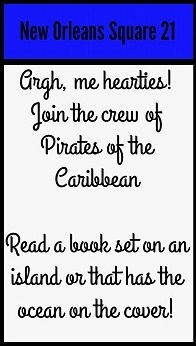 Book takes place in England (counts as an island).